Our research combines neuroimaging (MRI and EEG), with neuropsychological studies in brain-injured patients and healthy participants. We seek to understand the effects of brain injury in order to improve diagnosis and early detection and to find possible new treatments. For example, we study patients who have sustained severe brain injuries that result in vegetative state and other so-called ‘disorders of consciousness’. We also study neurodegenerative conditions like Parkinson’s disease and Alzheimer’s disease in order to try to understand more the causes and consequences of the memory, perception and reasoning problems that many of these patients experience. Finally, we develop web-based tools for the assessment of cognitive function in both health and disease via our free website at cambridgebrainsciences.com. 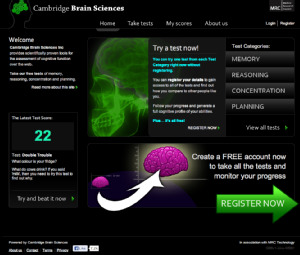 In 2009, we launched cambridgebrainsciences, a free web-based platform for members of the public and the wider scientific community to assess their cognitive function using rigorously tested and scientifically proven tests of memory, attention, reasoning and planning. Please visit the site, create a free account and join more than 200,000 participants who have already taken our tests. While the importance of the prefrontal cortex for ‘higher-order’ cognitive functions such as planning, working memory and attentional control is largely undisputed, no consensus has been reached regarding the possible fractionation of functions within this region. Moreover, whilst strong anatomical links exist between the frontal cortex and various cortical regions (e.g. temporal lobe), and subcortical structures (e.g. the basal-ganglia), the functional significance of these connections remains largely unclear. Our research in this area seeks to address these issues by combining neuroimaging methods (MRI and EEG) with neuropsychological studies in brain-injured patients. Disorders of consciousness, including the vegetative state, are some of the least understood and most ethically troublesome conditions in modern medicine. The term ‘vegetative state’ describes a unique disorder in which patients who emerge from coma appear to be awake, but show no signs of awareness. 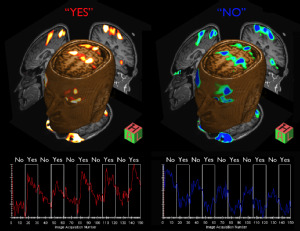 Although the diagnosis depends crucially on there being no reproducible evidence of purposeful behaviour in response to external stimulation, our recent functional neuroimaging studies have suggested preserved cognitive function in some patients who have been diagnosed as vegetative. The findings suggests that such patients may be able to use these residual cognitive capabilities to communicate their thoughts to those around them by simply modulating their own neural activity. Although only about 20% of patients with Parkinson’s disease develop dementia, less severe cognitive impairments are common even at the earliest stages of the disease. The pattern of these impairments is often described as predominantly ‘executive’, resembling that produced by circumscribed frontal-lobe lesions. 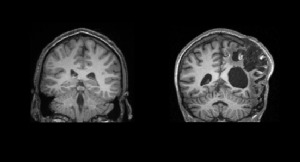 Research in this area seeks to understand these impairments by combining functional neuroimaging, psychopharmacology and neuropsychological investigations in patients. The results have implications, both for the clinical management of patients with Parkinson’s disease and for our understanding of the functional relationship between the frontal cortex and the basal-ganglia.